Pavement and gravel. Concrete and steel. Fundamentally, building roads and bridges sounds straightforward, but there’s more to it than you might think. There’s everything from geotechnical and environmental sciences to structural, seismic, traffic and electrical engineering, just to name a few of the disciplines needed to build highway infrastructure. Keeping up with the latest advancements in science and technology is vital to keeping our roads as safe as possible, and we do what we can to encourage up and coming scientists and engineers. That’s one of the reason’s we’ve established our Engineer-in-Training and Technician Entry Level hiring programs. But, we do other things too, like supporting BC students and the BC Science Fair with our very own Ministry of Transportation Awards. 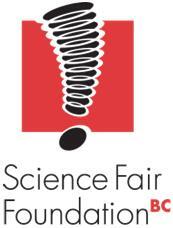 We’ve been involved in the Science Fair since 2005, and we’ve seen a lot of interesting entries over the years. Some of the past winners have included ways to save fuel and make vehicles operate more efficiently. There have been robots and navigation systems. The topics vary widely, but what remains consistent is the high level of quality and innovation in the submissions. As you can see by the winners below, this year was no exception. Sarah Martens from Barrowtown Elementary in the Fraser Valley won the Junior category with Oil Over Again. She wondered if there was a way to decrease the need for new oil and make better use of what we’re already using. So she designed a more effective oil filter, one that makes oil last longer and reduces engine wear. Claire Longcroft from Collingwood School in Greater Vancouver won the Intermediate category with her entry the Skid Lid Helmet Helper. Applying concepts of biometics, she created a new insert for cycling helmets that greatly reduces the impact a cyclist could otherwise suffer in an accident. Jacquie Gulevich from North Peace Secondary in Fort St. John won the Senior category with project called From Green to Gold. She studied the feasibility of harvesting cyanobacteria from Charlie Lake for biofuel production, something that could not only produce an alternative fuel source but also clean the lake in the process. It’s encouraging to see great young minds like these in action, and we’re looking forward to what they’ll accomplish in the future. Thank you to all who participated this year, and congratulations to Sarah, Claire and Jacquie!